Christian Lindberg Interview with Bruce Duffie . . . . . 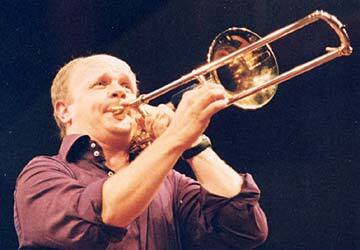 When I first met Christian Lindberg - way back in 1992 - he was just the foremost trombonist touring the world. His career was going at a great pace, and now, in 2008, he has increased his fame and artistry, and has added both "conductor" and "composer" to his impressive list of achievements. 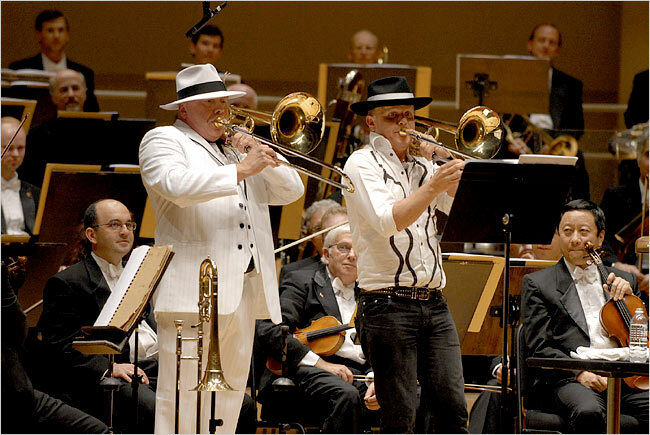 In 2002 he was back in Chicago to perform the Berio SOLO with the Chicago Symphony, and in 2006, Charlie Vernon, the bass-trombonist of the CSO was giving the world premiere of Chick'aBone, which Lindberg had written for for him. Charlie had previously premiered a work by Ellen Taffe Zwilich in casual garb, but this time he came out in a white suit and hat which elicited ooooos and ahhhhhs from the audience. The performance of the music garnered an ovation which the composer then shared with the performer. At that point, we were treated to the two of them playing together the Henry Mancini theme music from the TV series Peter Gunn. The photo below captures that very special moment. Being a progressive person who thrives on the cutting-edge, his website has all the latest details of his adventures and keeps the world up to date on his career. With that in mind, it's fascinating to look back and see where he was at the earliest stage of his international success. This interview shows him then and we note that most of his ideas were - and still are - right on target . . . . .
Bruce Duffie: You're on a tour of the U.S. How long are you here in Chicago? Christian Lindberg: Two days, I think. Then I go down to Texas and Oklahoma for two solo recitals and on to Oregon for four concerto appearances with the Portland Symphony. BD: What concerto are you playing? CL: Yeah, yeah. It's a 30-minute-long piece about a journey around the world. BD: Oh! Oh, I see. And you make the sounds of the motorbike? BD: Oh, with a leather jacket and everything? BD: Well, let's come back to that a bit later in our chat. First, how do you divide your career between solo recitals and concerto appearances? CL: This year I do 94 appearances altogether, and I would say maybe 60 of them are with orchestra. And then I do chamber music work with a pianist, Roland Pöntinen. We do about ten or so concerts a year, and then the rest are complete solo, unaccompanied solo recitals. BD: A full evening of unaccompanied trombone? BD: I would think that would be taxing both for you and for the audience. CL: Yeah, well, the thing is it's not unaccompanied, actually; it's with tape. Some new pieces with tape, and there are a lot of pieces which have theatrical elements in them, so it's actually quite exciting. It works quite well, I think. BD: Is it received well? CL: Yeah! Very well. Very well, I think. BD: Good. Now you've decided to be a solo touring trombone player. Are you unique in this, so far? CL: I think so, yeah. BD: Even Stuart Dempster [(b. 1936)] doesn't do that full-time. BD: Why did you decide to embark on all of this? CL: I decided quite early, actually. I was 19 when I started in a symphony orchestra. I was in the opera orchestra and I was a little frustrated, actually, so after a year I decided to quit and go for a solo career. For five years I did no extra jobs, no gigs at all. I just studied the trombone. CL: Literature and technique, art, all that you have to do to be able to be a concert artist, to be something for an audience to listen to. We can't just play, of course. So that's what I did for five years. Then from age 25, I decided I'm gonna live on this. I had two or three pretty bad years, [laughs] and then I had about three or four not bad but not good, either years. And now the last three, four years are very, very good. CL: Yeah! Yes, it works very well now. BD: What kind of response did you get when you went to agents and said, "I want to be a touring trombone player"? CL: [Bursts out laughing] Well, I had a Swedish agent in the beginning and they were trying to get me an agent in London. We wanted them to come and listen to my recital debut in London, and they answered that before they would go to a trombone recital they would have to be heavily drunk. So there was a lot of resistance in the beginning. BD: So how did you break that down? CL: With determination, quality and humor, I think. BD: You could break it down for agents. How do you break it down now for audiences? CL: For audiences it's not very difficult, actually. I think the trombone is the instrument of our century. [Earnestly] The audience needs something new. The way classical music is shown to the audience is in a 19th century format, which is out of date, I think. It has to come with something new. I think that's the reason why the pop music is so extremely much bigger than the classical music. Classical music is not more than eight percent of the whole music business. I think something new really has to happen, and I see that now because there's a big response in what I do. BD: Are your concerts sold out, then? CL: [Without hesitation] Yeah! Yeah, in most the whole world! I did my debut in Japan quite recently, and it was sold out a month before. BD: You seem to have done mostly new repertoire rather than transcriptions of others' music. CL: I want to do old and new. But I don't want to do transcriptions in a way I don't want to. I don't want to be put into a certain... what do you say... ? CL: Yeah! [Laughter] Thank you for that. BD: The Germans call it a Fach. CL: Yeah, yeah, Fach. I want to be serious, and I don't want to do too much Flight of the Bumblebee and things like that. I do it, because I think it's fun to do it, but as an encore. My goal is, first, to put all the solo music of the trombone on record as a document to show that there is a repertoire, because people don't think there is a repertoire, and there is. I play classical pieces with orchestra, such as the Michael Haydn Concerto in D major for alto trombone (1764) but then my main goal, I must say, is the contemporary music. Now Xenakis has written me a concerto which I will premiere next year. [See my Interview with Iannis Xenakis.] Takemitsu is writing me one, and there is a young Swedish composer who is making a concerto for me and the whole process will be filmed by a German film team on 16 millimeter high definition TV. BD: And made into a documentary, then? CL: Yeah! Into a documentary. BD: Are these composers who come to you and say, "I'd like to write a piece for you," or do you go to the composers and say, "Please write for me"? CL: It depends who it is. [Laughs] Xenakis was a hassle. A big hassle. BD: You mean he didn't want to write for you? BD: And you were just heaping a trombone concerto on him. CL: Yeah! And he couldn't really understand why. But there was another trombonist, Benny Sluchin [Boulez's trombonist in the Ensemble intercontemporain], who had approached him for five or six years about a solo piece, and when I came he said, "Well, I might write that solo piece now. I might do that." BD: Because he now had two players interested in it? CL: Yeah! Then I recorded it and sent the record to him, and that was when he changed his mind. That was really a big moment for me when I got the letter he's saying, "I will write a trombone concerto. I could have it ready in '92." That was in 1989. BD: That's not too bad a lead time. BD: Do you have the part? BD: How long will it take you to learn it and do it justice? CL: I got the part in good time, which I was very happy for. I got it last summer and I will do the premiere in March of '93. So I have a lot of time. But it's incredibly difficult and I work on it every day. CL: Yeah. I work on it every day. BD: Are there any things in the score that make you call him up and say, "What do you mean by this little squiggle?" CL: No. I don't think so. I don't think he would tell, anyway. [Both chuckle] He's a very interesting personality, too. He's very straight and that's what I like with him, no compromises whatsoever. When he wrote the piece he said to me, "Here is the score; there's no effects in it, nothing like that. You might not like it, but I wanted to write it like that because I wanted it to last more than ten years. I think effects get very fast out of fashion. If you don't like it, don't play it. If you like it, play it." That's what he said. BD: I can't imagine that you would've not liked it, though. BD: Is there anything that someone could write, within the compass of the range of the trombone, that you could not play? BD: Obviously someone could put pedal notes or top notes that you can't get to, but within the limits of the trombone, is there anything that is not accomplishable by your technique? CL: Of course there are some things. You never know. What Xenakis has done now is to write something that is out of the register. When I saw it, I said, "Now this is really very difficult, it's almost impossible." He has about 25 high Fs and G-flats which are the top register. You can have one or two and then normally your lip goes. BD: So he exploited it. CL: Yeah. But for me it's a big challenge. We made an arrangement: I will try and be able to play it in September or October. I will see if it's possible or not. If it's not possible he's gonna change it, but I want to give it a try and I think I can make it now. BD: If the whole concerto is all right except for a half-dozen tiny notes, will he change those notes for you, or will he change the whole shape of the piece? BD: So when you get a piece that looks impossible, then you try to make it possible! BD: It sounds like they're asking you to run a three-minute mile! BD: You don't lose the bottom, the pedals, do you? CL: No, no. You have to make sure that you keep them. Keep working on them, that's very important. BD: If you were in an orchestra, playing first trombone, you wouldn't ever (or very rarely) have to use the pedal register; and if you were playing third trombone you wouldn't have to get up into the top. But as a soloist you have to encompass the whole range. CL: Yeah. Yeah, I have to. BD: Do you ever wish you could just take half of it and concentrate on that? CL: [Wistfully] No, I don't think so. I think once you reach something it tends to stay there if you just keep it alive. BD: But I assume you have to practice it every day to keep the chops in shape. CL: Oh, of course, of course. I practice four to five hours every day. I do it when I'm on the road, too. So that's part of my life, but I like it. I like practicing. BD: You can never take a day away from it? CL: Not really, no. If I take two weeks off from trombone playing, that means six weeks without playing concerts, because it takes a month to get up to shape again. I did it last summer. I took six weeks off and took three weeks without playing, but I didn't like it. [Chuckles] I missed my trombone. BD: Do you always use the same instrument, or do you use different size instruments when called for? CL: Of course I play the alto, tenor, and alto sackbut, tenor sackbut, but I think it's very important to get used to one instrument, to be one with it. BD: Has it got a trigger or two? BD: What about mutes? Do you find yourself using a lot of mutes, and are new mutes being designed for you? CL: No! There might be in the future but I, personally, don't like mutes. I think that the trombone itself can make different sounds by using different kinds of vibratos, different kinds of techniques. I think it's better to use the trombone itself than to put a mute in. BD: So you'd rather do it in the lips. CL: Yes! I think so. You rarely use a mute on a violin but the rest you do with different bowings and things. I think we have to create a tradition to do that with brass instruments, too, to make it more alive. BD: I would think that a bunch of mutes, though, would give you more colors on your palette. CL: [Thinks for a moment] Yeah, but you have to change them, [chuckles and goes through the motions, in an exaggeratedly cumbersome manner, of changing mutes] in and out. Of course, for the pieces that need it, I use it. In the Xenakis there is a straight mute, but personally I think I think the trombone is so rich in itself, so I rather stay with just that. BD: Do you ever play a valve trombone? CL: [Quietly, but a bit quizzically, as if surprised to be asked such a question] No. I don't. BD: You have no interest in it? CL: [Emphatically and without hesitation] No. [Laughter] Ahhhhhhhhh, I think it's something that doesn't work. It takes away the whole uniqueness of the trombone, the sound created with a tube that goes like this. [Makes a gesture showing the curved shape of a trombone's slide] You can move the slide and play blue notes. Also you can do all sorts of things like that. BD: Do some composers demand different intonations, different tunings? CL: Yes, of course! Of course. It's expressionism. Yeah, Xenakis, of course. There's a lot of quarter-tones in the pieces that I do. The Sandström concerto, of course, asks to play the glissando and the motorbike sound. BD: Do you ever have to speak into the trombone? BD: Is that as weird as it sounds on a couple of records I've heard? CL: [Explodes in laughter] It is weird, yeah. Yeah. CL: Oh, yeah. It's a fantastic piece which Stuart Dempster does. Fantastic, yeah. He does it very well. It's a great piece. BD: That's a very theatrical kind of piece. BD: When you play in different halls, do you adjust your tone or your technique at all if it's a small hall or a large hall? CL: Yeah. Very much, I think. But you do it naturally. You have to get used to the hall and you have to play differently. You do it almost automatically, but you also have to get used to it and think while you do it. If you have a small hall it's like double the amount of work you have to put into it. You have to do all the reverbs yourself, and at the end you have to tail off the notes. And in a big hall with a big acoustic, you have to be very, very careful with a staccato so it doesn't become ugly because it sounds like a bang against the wall. So it's quite intricate because the hall, the room, is very important to the sound. BD: And are you conscious of the audience when they're sitting there? CL: Oh, yes. Of course, definitely. Definitely. It's very important. The contact with the audience is something that's very exciting especially in a piece like the Cage Solo for Sliding Trombone [(1957-58), a segment of Cage's Concert for Piano and Orchestra. See my Interview with John Cage.]. It's very difficult to put it on a record, actually. I put that on a record and I didn't know how to approach it because there are a certain amount of pauses in there which are spaced in the music. But it's your own choice, how long these pauses should be. In the concert version I do a certain length. Then when I came to record, I thought, "Well, what should I do now? Should I do it less when you don't have the visual effect? Or, should you do the same, or what?" But I decided to go the opposite way, to make the silence even more important. So I did a very long version of it which pauses for a moment. It's very controversial, I think. BD: Probably some people would think their CD player has died. CL: Ah, yeah, of course! Of course. My colleague, Roland Pöntinen, the piano player, used to put it on when people came to his home as guests because there is sound and then it's complete silence, and then suddenly it's sound. They don't realize it's a record on. They just hear those noises suddenly coming out and then they start complaining. BD: They think someone's practicing next door? BD: Now in all of this you're making new friends for the trombone and you're also making new friends for new music. CL: Yeah, I hope so, yes. BD: Is this is one of your goals? BD: And then dropping them! CL: Well, dropping them or not, but they do so many world premieres they don't learn the pieces by memory, which I think is one of the most important things to do. I learn everything by memory. Even if it's a new piece. Even if it's complicated. I think a piece of music deserves that. And if you don't do that, you can't get through enough, I think. If you don't work on it for a long time, you can't get through to the audience, and the audience will sit there and it will have the opposite effect from what's desired. That's why contemporary music concerts are so badly attended, I think. BD: So where's music going these days? CL: That's very difficult to see. Very. I think rock music has quite an important role, actually. More than we thought in the '60s. People like Prince, for instance, and also the jazz musician Miles Davis, and Coltrane, of course, have a big influence on the music. The serious composers, like Xenakis, Stockhausen, Cage, Berio, the new ones, will be a mixture of those together, I think. The young composers now, with the computers and everything, have enormous possibilities. They can hear the pieces, how they sound, with the computers. So many possibilities. I think there's gonna be a lot of more influence and involvement from African music, from all sorts of music. That's where the music goes now. BD: It seems like it's coalescing. CL: Yeah! Everything, everything. And it's already done that. A lot of composers, like Schnittke for instance, are mixing everything and they call it postmodernism. That is something that doesn't work yet, but the first person who can get all these together and make one thing of it, that's the one that's gonna be the 21st century composer, I think. BD: Do you think they're going to make something of this, or are they going to find the part of it they want to use and then use that part? CL: ...Webern. Much more than those people. Those people are one part of it, but Stravinsky made everything together in a shape that works as art. And the person who does that for the 21st century will be the one, I think. BD: Do you think that Stravinsky will last into the 21st century? CL: Of course. No doubt about it. His popularity will grow. He will be the Bach, the Mozart, the Brahms of our century, I think. BD: I know this is an unfair question, but do you see anyone emerging, yet, for the 21st century? CL: I don't know, actually. I think the young Swede, Jan Sanström, who wrote this Motorbike Concerto, is getting there with this piece. It's a piece that has a mixture of everything. It's contemporary music, and it's a piece that has a big effect on the audience and gets a big response, at least in Europe. We will see what happens at the U.S. premiere in Oregon. So he's getting there, but I don't know; it's very difficult to say. BD: When you play a concerto, you are often the soloist on a mixed program. Is that better, or just different, from an all-contemporary program? CL: It's much better, I think. That's the way to do it, I think, so I'm very happy in Oregon they have the Motorbike Concerto and the Alpine Symphony of Strauss that also includes sound effects from a wind machine and thunder machine. When I did the premiere with with Esa-Pekka Salonen, the program also had Mahler 7. So it's the best way to get it across to the audience. BD: The audience is not a contemporary-music audience, they are really there for the other piece, and you are giving them something new. BD: You like winning over the unsuspecting people, then. CL: Yeah! I think so. I think music is music. I don't want to put it into a Fach, as you say. Music is the same in every century. They say the same thing, but they find the language of the century. They had to use the language of the century. That's very important. But they say the same thing, I think. BD: Well, let me pursue this just a little bit further: what is the purpose of music? CL: [Quietly, as if speaking to himself] What is the purpose of music? [In a normal tone of voice] It's communication, I think. That's what it is. And communication is the base for human beings. A human being can't be without communication, and this is a language to communicate with. You have the normal speaking language where you can reach certain emotional areas within another person, but with music you can reach other areas. This is another level of communication, I think, and that's what it is - communication. BD: Is contemporary music, then, a new language or an expansion of the existing one? CL: [Thinks for a moment] I don't know. The language changes. It takes something from before and mixes the new it into it. [Pauses for a moment] You're a representative of your period, I think, as human being. It's a difficult question. I read a poem quite recently by a great Russian poet named Osip Mandelstam, and he says that a person is a representative of his time, which means that that is what you are. You go around here as a representative of your time, so what you say and what you do will later be related to our time. BD: You, of course, are making recordings which, presumably, will transcend your time - assuming that there are people around to listen to recordings 100, 200, 300 years from now. Is that a good feeling, or does that make you a little more nervous about what you lay down on the various tracks? CL: Of course, it makes me very nervous. Every record is, in a way, like a birth. It's really difficult. It's tough. You always go in there with your maximum and then you always come out a little bit disappointed. But that's life; that's what is it like. BD: Do you ever find you're competing against your record when you go back into the concert hall with the same piece? CL: It could be. Could be, but not really. A concert version is more fun to do and I take much more risks when I do that. On a concert performance, I allow myself to split notes. I want to do that because it's part of it. On a record you don't do that. You mix it in a certain way or you edit it in a certain way so those things go away. I don't like missed notes. I try to avoid it, but if it happens... On the other hand, when I go onstage, always when I go onstage, I think, "Maybe tonight I will do a performance without the mistakes." If I go in with that thought, it always happens, probably in the first or the second or third bar... something. [Chuckles] Probably most of those things are not noticeable for an audience. It's just for some people who know the piece and know about it, or have heard it many times. BD: Do the mistake early and get them out of the way. CL: Yeah! Yeah! [Laughter] But then you just think, "I failed this time, too, so it's better to just go." BD: Is there a possibility, is there even a way of doing a perfect performance? CL: [Without hesitation, in a low, gravelly voice signifying the impossibility of such a thing] No. No way. BD: So you always strive for it, but you'll never get there? CL: Yeah. You'll never get there. But every performance has something special, a certain atmosphere with it. And every performance should be different. That's what it is about. That's why computer can't take over. CL: They are taking over some parts of the business. It's a big question, actually, it's really a big issue. But the actual communication system they can't take over. BD: When a piece is being written for you, what advice do you have for the composer? CL: [Takes a deep breath] Ahhhhhhh. I have now made a DAT tape with all the possibilities of the trombone, all the different aspects, and I've put down a long list of what the trombone can do, with examples. What I want to do is give this to them and put them in complete freedom. BD: Do you expect them to use all of them in any one piece? CL: No, no. Not at all. I expect them to write what they want to write. I don't want a person to write something for me that doesn't know me and understand my performance, that doesn't understand what I do and what I stand for. I'm not interested in that. If someone writes for me I would like them to understand who I am. Otherwise, they can write a piece, of course, for someone else and I can choose to play it. But if someone writes something for me to premiere, I want them to know me. BD: But if they write it with you in mind, does that preclude its performance by others? BD: Then let me turn the question around. Do you enjoy playing pieces that have been tailored for others? CL: Yes! I think that's okay. I think that's okay. I enjoy that. The thing is, even if someone writes something for me and it's written with me in mind, when another person takes it over and does it, it becomes something really exciting because it changes a lot of things and puts things in a different way. I don't want other people to do it badly. I definitely don't want that. I get very irritated when I hear people play pieces that I know what the composer intended and they don't know it. I get very angry then. But if someone does it well and does it a completely different way from me, I'd think that's a big success. BD: What advice do you have for other trombone players coming along? CL: I have advice for the young players to really go for it because the time has come for the trombone. 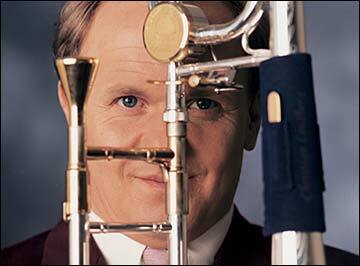 BD: Do you see the time when there will be many touring virtuoso trombone players? CL: Yeah, definitely. There are jobs. At this point I actually have to turn down half of my offers. So that means there would be a place for another one. BD: Unless they're wanting Lindberg, and not somebody else. CL: Yes, but certainly there will be other players that do the same thing as I done. I hope so, definitely, that when they are twenty-three or so, they decide to go for a solo career. I know already some people that I have on my master class that I really have hope for. BD: So you are doing some teaching, then? CL: I do a very small amount of teaching. I have a master class the north of Sweden for one week where I pick eight students. And I have one in Germany where I pick eight students. And that's it. Then I do, of course, a couple of master classes, not very many. I do them in connection with university concerts in America because it's part of the way the universities want it. And I think that's a good way to do it. But otherwise, I try to avoid it because it takes too much time. BD: You have to be selfish with your time and your technique. BD: Is playing the trombone fun? CL: [Thinks for a moment] Uhhh, is it fun? Yes, I think so. [Pauses for a moment, then speaks the word a bit tentatively, as if unsure of its appropriateness] Fun. Hmmm... No, it's a hassle. [Bursts out laughing] I think it's like a drug in a way. BD: You're addicted to it? CL: Yeah, I'm addicted to it. Yeah, definitely. You go there and have a full day of playing or having done a full day of recording, or having done a full recital and after that you feel sort of hyped up. You really feel that you've got something from it. BD: And then it takes you a while to come down? CL: Yeah. Yeah. That's right. But you get used to that after a while. It's not as bad as in the beginning when every concert was big and afterwards you wanted a reward. But nowadays you can't get that. You have to immediately think of the next concert when you end the first. Otherwise you can't live with it. 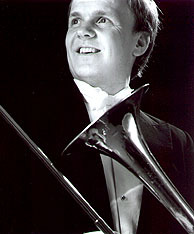 Christian Lindberg´s achievements for the trombone can only be compared with those of Paganini for the violin or Liszt for the piano. 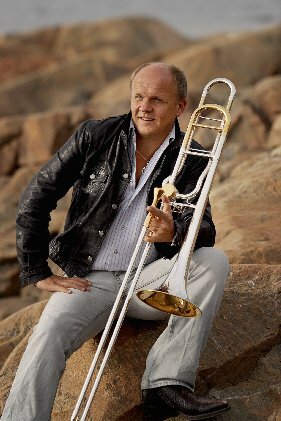 Having premièred over 300 works for the trombone (including more than 30 composed by Christian himself), recorded over 70 solo CD:s, and having an international solo competition created in his name in Valencia, Spain, Christian Lindberg is today nothing less than a living legend. 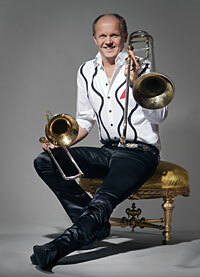 Lindberg took up the trombone at 17 inspired by the jazz trombonist Jack Teagarden. At 18 he gained admission to the Royal College of Music in Stockholm and after having played for only two years he got a position as trombonist in the orchestra of the Royal Swedish Opera in Stockholm. At 20 he left the orchestra, and has since built up a unique and impressive career as the first trombone soloist in history, as well as embarking on two new enormously successful careers as conductor and composer. At the same time, Christian and his wife have raised a family of four children, now grown up youngsters with their own careers. Today Lindberg´s schedule is fully booked for years ahead. This schedule combines being chief conductor of the Nordic Chamber Orchestra and the Swedish Wind Ensemble with guest conducting of orchestras such as the Rotterdam Philharmonic and Giuseppe Verdi Orchestra of Milan, working on composition commissions from ensembles such as the Chicago Symphony Orchestra, the Australian Chamber Orchestra and the Swedish Radio Choir; and continuing his solo appearances with orchestras such as the London Philharmonic, the NDR Orchestra in Germany and Tokyo’s Yomiuri Orchestra. Parallel with all these activities, Christian Lindberg makes sure he can devote some valuable leisure time to his family of four youngsters and his wife at their country residence on a peninsula of the beautiful Stockholm Archipelago. This interview was recorded in Chicago on April 2, 1992. Portions were used (along with recordings) on WNIB in 1992, 1993 and 1998. This transcription was made and posted on this website in 2008.